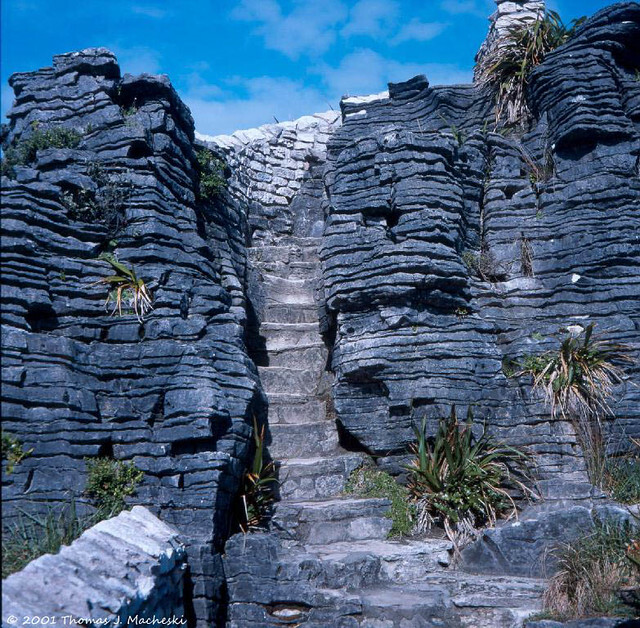 We arose late, and didn’t get to breakfast until 09:00, no worries in this case since breakfast is served until 10:00 at [ Punakaiki Rocks Hotel ]. This is quite a nice place, opened up this spring (April). Following breakfast we took the last of the luggage out to the car, and set off for Nelson, on the opposite side and at the north end of the South Island. 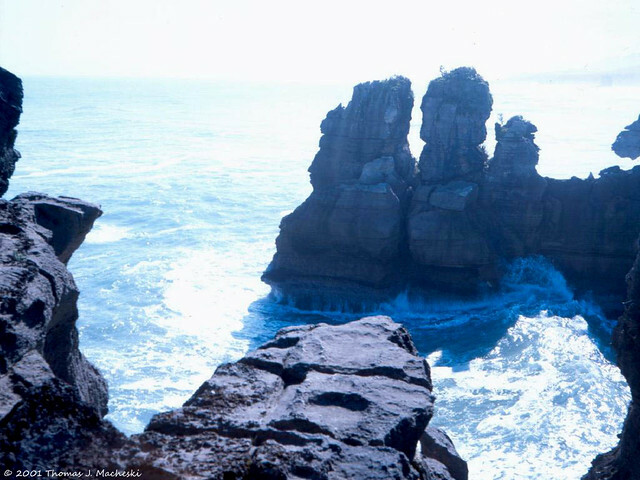 Our first stop was on half kilometer away, once again going to visit the Pancake Rocks. The Old Man co-operated this time, and we both obtained some good shots. It probably helped that the tide was coming in. 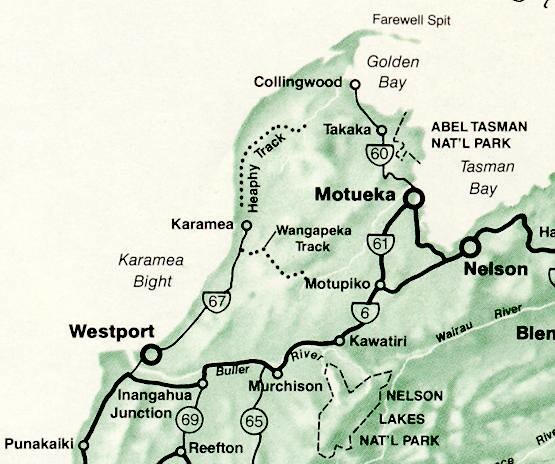 Then we truly departed, driving north to Westport, then east and north through the Buller Gorge. This is another spectacularly scenic area, but we both rather perversely decided we liked particular aspects of the road itself. One, we did photograph, Hawk’s Crag; the other we did not, being busy negotiating a one-lane curve around another prominent and rather vertical ridge. This particular curve calls for a speed of 15 kph, and one would be wise to heed this notice. The specific clue are the two large convex mirrors located at either end so that motorists may see if there are cars or trucks already negotiating the route. Hawk’s Crag, a bit further along uphill, is a “half-tunnel” carved into the crag, also one lane wide. We took the opportunity to pause here, at a scenic pull-out, and along came an obliging petrol tanker truck to politely pose as it traversed the Crag. From here on, we confess to early sensory overload. We did pull out again at a picnic stop; mostly I wanted to get out of the way of someone who felt I was driving too slowly. We lucked into the site of an old gold-mining town. We rolled into Nelson about 17:30, and found our hotel without too much trouble. [ Trailways Hotel, 66 Trafalgar Street, Nelson ] We are definitely back in a densely populated area, something we’ve not had to deal with for the better part of a week. Even Greymouth (the largest city population on the West Coast) isn’t particularly big, compared to Nelson. Now we’ve eaten dinner, and it’s time to get this out to the not-so-eager recipients. I've been shaking my head about the differences in tech and web between the time of the trip and the retrospective. All of these entries went home on the days posted (more or less) as e-mails to a list of friends addy's. Today, I'd be posting them to this blog, and the photos to the hosting service du jour. Mentioned the other day the maps I collected while there; I'm rather fond of maps, and hold that map-reading skills are paramount to being able to call oneself literate. I still collect printed maps, and will I expect despite the availability of maps on the Web. Still, I'm looking at how to post links to some of these specific sites on Google Maps, and to either the Google Street or other photos associated with those sites. 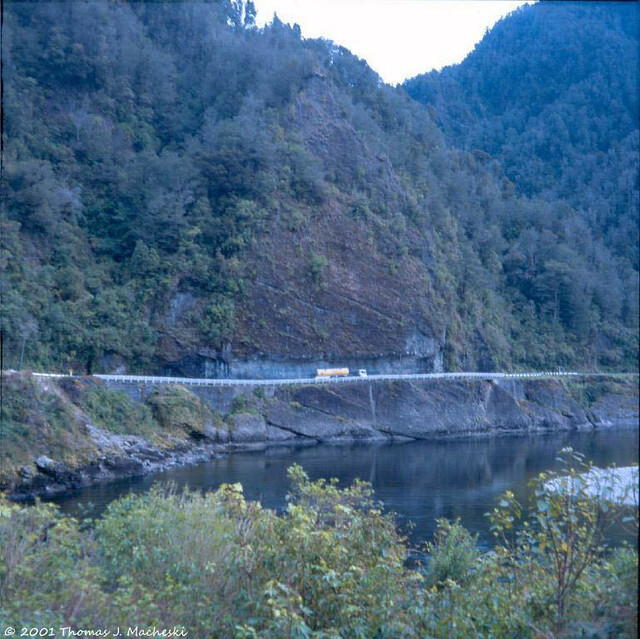 The curve around the promontory on the Buller River for example: there are photos showing that. We didn't make any; I drove, Herself freaked out being right on the edge of the chasm (even though it isn't terribly high off the river there). I guess what I'm thinking is the travelogue, as originally done, truly does represent being on the cusp at the turn of the century. This entry was originally posted at http://madshutterbug.dreamwidth.org/126758.html. Please comment there using OpenID.